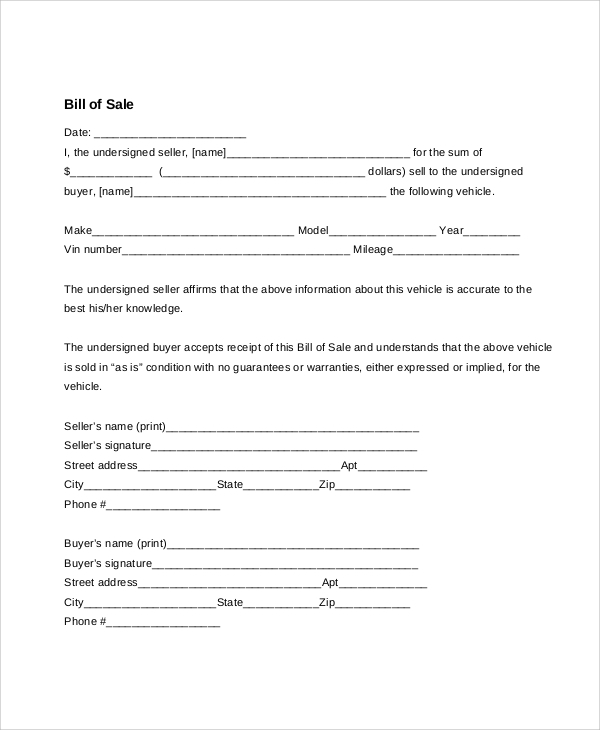 A bill of sale for a vehicle is a document which records the transaction between the buyer and seller of the vehicle and is equally important for both the parties. For buyers, it provides detailed information about the vehicle and transaction and for the seller; it specifies the date and the amount at which the vehicle was sold, along with the information about the buyer. 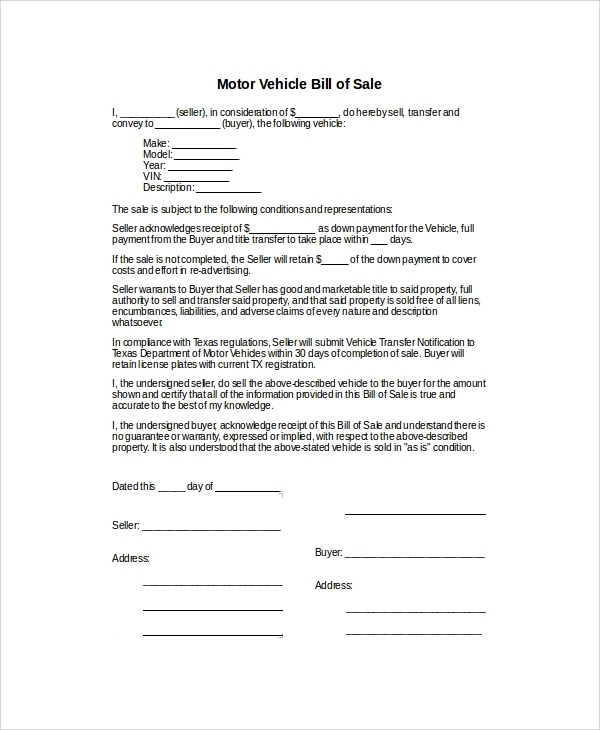 This Bill of Sales Samples can be used by sellers of a motor vehicle, DMV vehicle and other types of vehicles. 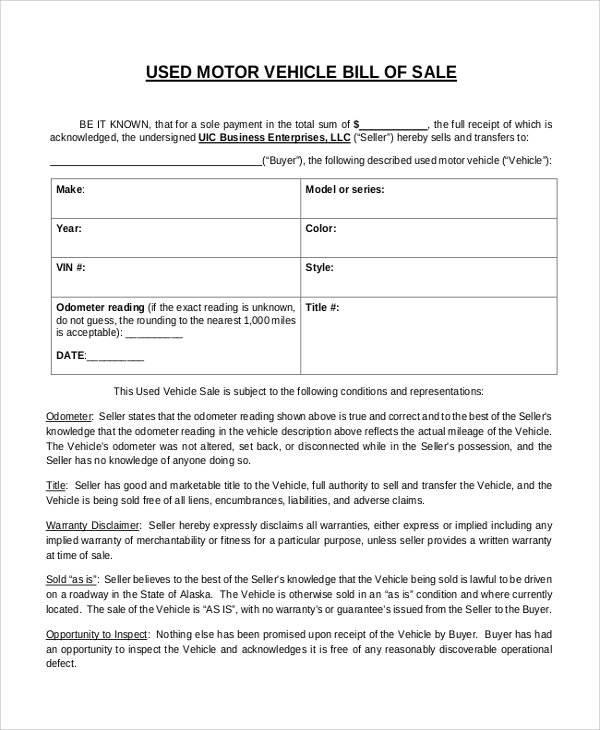 If a motor vehicle is being sold, this motor vehicle bill of sale can be used as a legal agreement between both the parties. Information about the buyer, seller, transaction and the vehicle needs to be added to this sample. Off-highway vehicles are different from your normal motor vehicles and thus, need a different bill of sale. These Sales Receipt Samples can be used while selling an off-highway vehicle and a copy of the same can be provided to the seller and buyer for future reference and avoid any legal troubles in future. 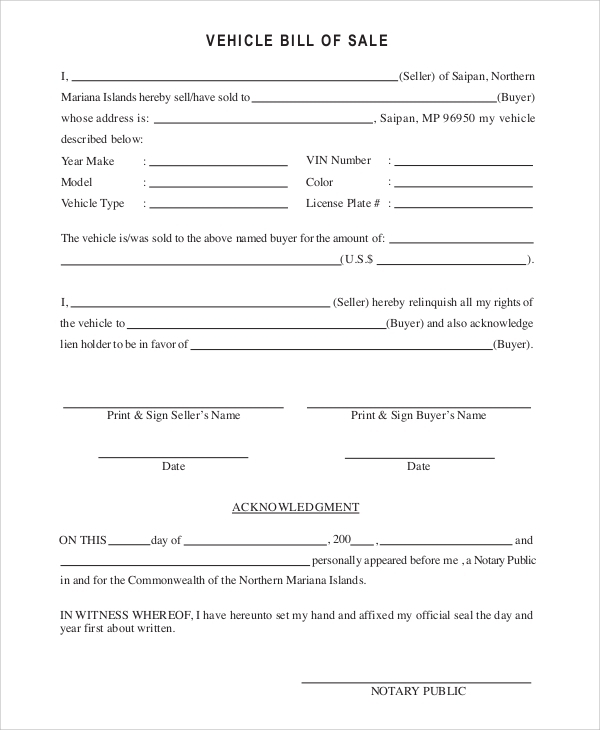 If you are looking to sell your motor vehicle, you should use this used motor vehicle bill of sale to have brief details of the transaction between both the parties. Details about the transaction, vehicle, its engine, model, etc. should be added before both the parties sign the document. 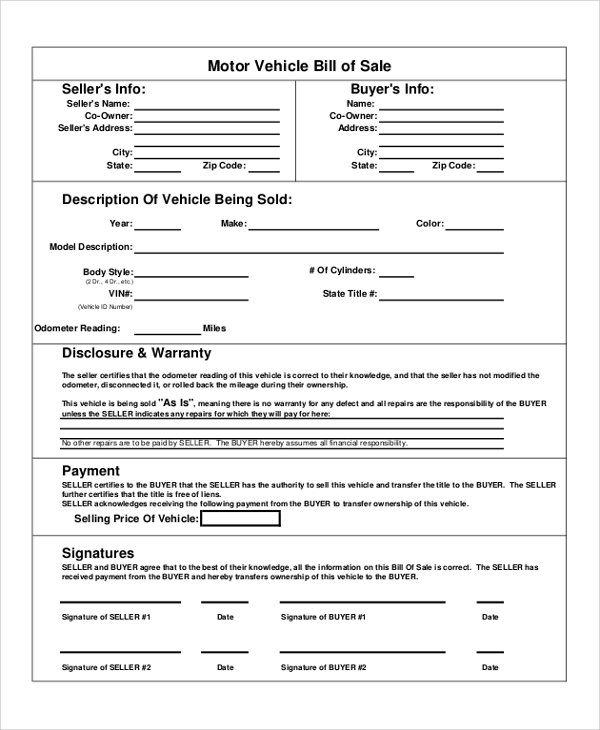 A bill of sale for a vehicle is obligatory while selling a vehicle. It is necessary for both buyer and the seller, as it offers detailed information about the parties, the vehicle, and transaction. This document can be used for future references to avoid any legal discrepancies in future. You only need to select a sample, download it and then print the same to add all the relevant information. You may also see the Boat Bill of Sale Samples. 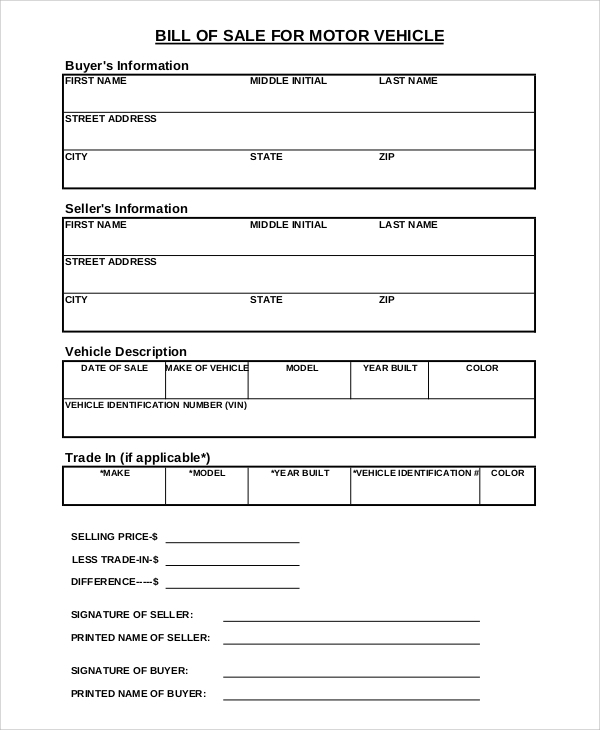 If one is looking for a simple bill of sale for a vehicle, this Blank Bill of Sale Samples for a vehicle can be an excellent choice. It allows one to add all the important information about the transaction which both the parties can use if at all there are any discrepancies in future. 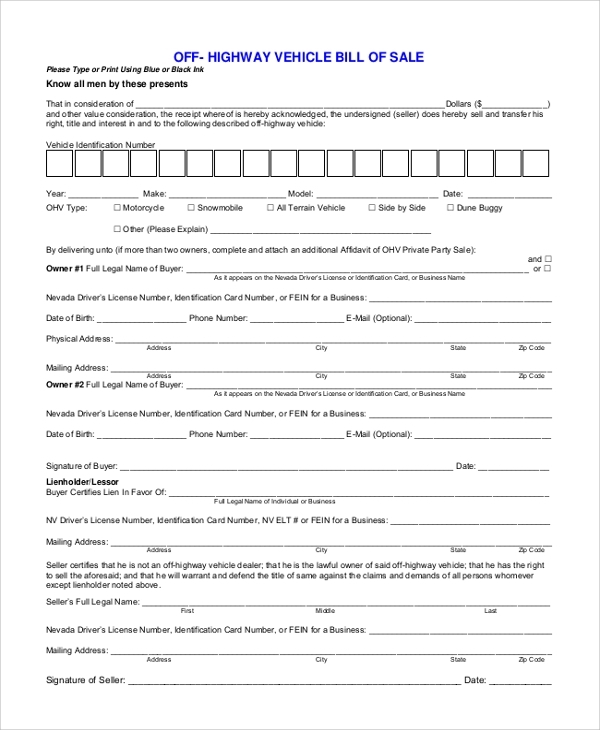 If a vehicle bill of sale agreement is to be submitted to DMV, this bill of sale sample can be used for the said purpose. It requires one to add detailed information about the vehicle, buyer’s name, seller’s name, transaction, etc. before submitting it to the DMV. You may also see the Gun Bill of Sale Samples. How to use a Bill of Sale for Vehicle? 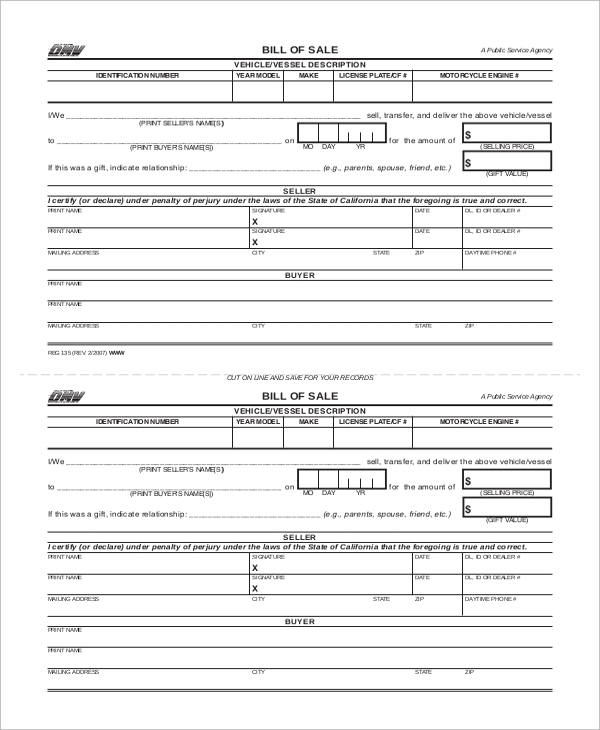 Many different types of bill of sale for the vehicle are available here. Select one that best suits your requirement and downloads it with a single click. The documents are print-ready and can also be edited before printing. Print the document and then add the required information to have a professional bill of sale in the least possible time. How to Select a Bill of Sale for Vehicle? Depending on the type of vehicle you have, you can easily select a bill of sale. Apart from types of vehicle, there are samples which only include brief information about the transaction and one’s that require detailed information. Depending on your requirement, select any sample that you want. The Bill of Sale DMV, motor vehicle, off-highway vehicle and used motor vehicle available here can be utilized by anyone looking to sell or buy a vehicle. Rather than spending a lot of time in creating one yourself or hiring legal help, one can easily download the sample and print the same to have a bill of sale that is accurate and has all the relevant information about the transaction.